Hybrid Cloud Engineering Blog: C2R error: "Is your internet connection working? Do you have enough free space on your main hard drive?" C2R error: "Is your internet connection working? Do you have enough free space on your main hard drive?" 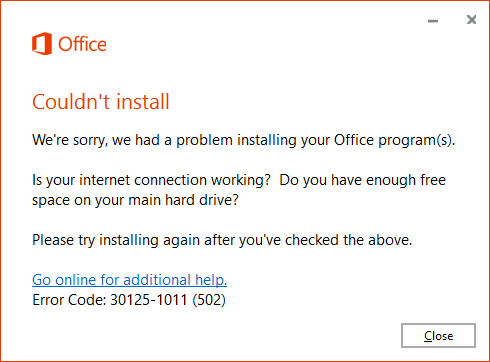 We're sorry, we had a problem installing your Office programs(s). You definitely know that there is no issue with the Internet connectivity and you have quite enough free space on your main drive. 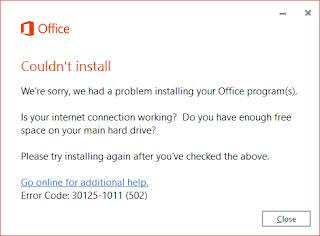 Move your C2R installation executable (C2R MS Visio or C2R MS Project *setup.exe) to the same location where ODT has downloaded Office 365 ProPlus installation files.